Compare your solution to one provided. Breeds: We’ll be adding a factory that emits CO2 into our Greenhouse Gas model. Both the factory and the CO2 are new “breeds” or types of agents, because they behave differently from the other breeds or agents in the model at present. CS Review: code and concepts useful for the modification. Use the Edit Breeds button in the Spaceland area to create a new breed. Click on “Add Breed” to add a new breed. 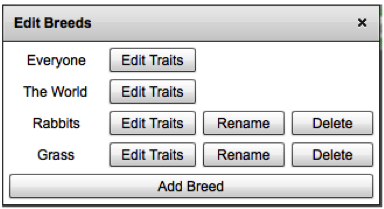 In the “New Breed” dialog box, give the breed a name and press OK.
Have the students use the Model Design Form to guide their modification process. What are we missing from this model? Greenhouse gases! Identify the essential aspects of the modification to include in the model and code them. In this lesson plan, one potential way to add a factory that emits CO2 is presented. However, this activity allows for student freedom in terms of breed traits, number of factories, and also the way they emit CO2. Incorporating this freedom in the lesson can allow students to have more control over their learning. Let’s think about factories emitting CO2 and what are the essential parts of that we might be able to include in our model. Keep it simple! Factory – it’s a building that emits a lot of CO2 while it’s running. CO2 - it comes from the factory and rises. It blocks heat from escaping. It eventually decays if left alone for enough time. Both the CO2 and the Factory will be new breeds. In pairs, open up your Greenhouse Gas model or start from the base model (www.slnova.org/GUTS/projects/22078). We don’t need the albedo slider for this. Take turns driving and navigating. Remix it and call it "Greenhouse Gases with Factory and CO2". Add a breed for CO2 and a breed for the factory. Navigate to the code. Are there tabs for CO2 and factory now? Great! Now it’s time to code some behavior for our new agents. Add CO2. Once the CO2 are created, they need some behavior. See if you can make the CO2 move upwards in the atmosphere, hover then decay. View the video of a model with CO2 (note: there are many possible solutions). Upload a link to your new model and your model design form to your portfolio in the section "SL Nova projects- Earth" under the heading "Greenhouse gas model with Factory and CO2". Reflect on how you could make this model more realistic. For example, in your community, what would be a relevant example of something that emits CO2?